Mahatma Gandhi, whose mandir (a Hindi word for "temple" or "place of learning") is hosting the 27th edition of the International Atomic Energy Agency's Fusion Energy Conference, would have blessed this crowd. More than one thousand men and women from around the world gathered in his hometown to share knowledge and experience in order to solve one of humankind's most daunting challenges. Shishir Deshpande, head of ITER India, proceeds to the ''lighting of the light'' in the vast conference room of the Mahatma Mandir in Ahmedabad. From left to right: R.Chidambaram, former Chairman of India's Atomic Energy Commission; M. Venkatesh of the IAEA; Shishir Deshpande, Head of ITER India; R.B. Grover, of India's Atomic Energy Commission; D. Ridikas of IAEA; and S.M. Gonzàlez de Vicente from IAEA. 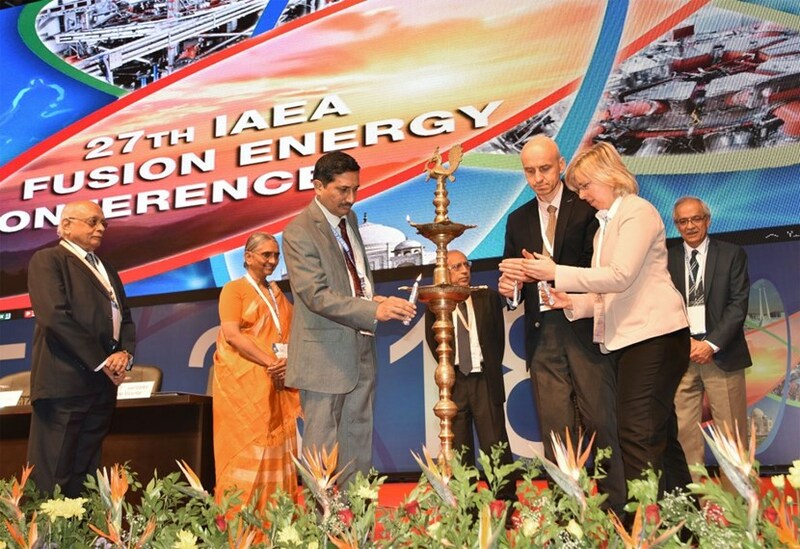 Hosting the world's largest fusion energy conference "is an honour that India deserves," said Meera Venkatesh of the International Atomic Energy Agency (IAEA) in her inaugural address. India, which entered fusion research in the early 1970s, has risen in a few decades to the forefront of the discipline. As a nation of close to 1.4 billion inhabitants, heavily dependent on fossil fuels (81.4 percent) for electricity generation, India sees its future in nuclear energy in all its forms. "It is clearly an essential option for energy safety," said Rajagopala Chidambaram, a key architect of the country's nuclear program and the former Chair of India's Atomic Energy Commission. "I don't see any other option on the horizon." For Nawal Prinja, another figure from India's nuclear sector who spoke on the first morning of the conference: "Fusion is our future. Fusion technology is already working; what's missing is the extraction of energy from fusion reactions." Presenting ITER progress to the FEC audience, Director-General Bernard Bigot once again stressed the importance of ''working as one'' towards the project's success. Half-joking, half-serious, Chidambaram described fusion as "a physicist's delight but a huge headache for the engineer." And this is what the five-day IAEA Fuesion Energy Conference will be about: exploring conceptual delights and technological headaches, the breakthroughs and the obstacles on the way to realizing the Promethean dream of harnessing fusion energy. Fifty years ago in Novosibirsk, at the third gathering of what was then called the Conference on Plasma Physics and Controlled Nuclear Fusion Research, a new type of fusion device, christened with the Russian acronym "tokamak," entered centre stage (see box below). Today, the hopes of the worldwide fusion community rest on the largest tokamak ever built and the first designed to deliver a net energy production. 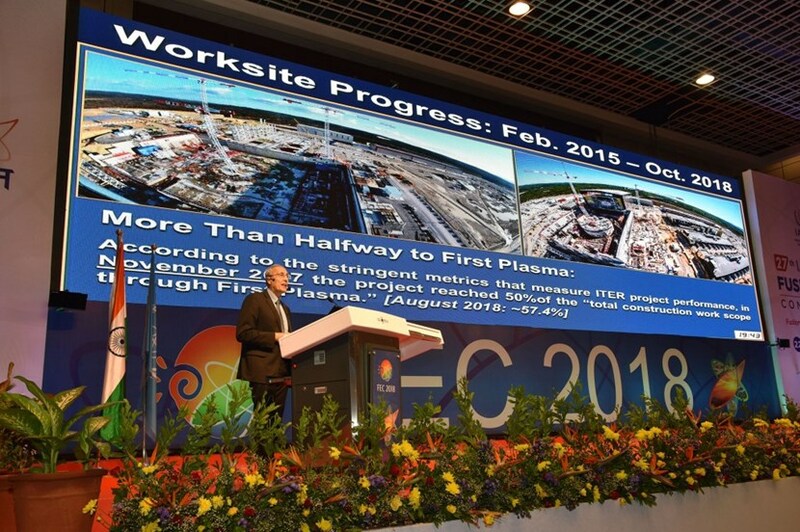 ITER, whose progress toward First Plasma was presented by Director-General Bernard Bigot at the opening session of the conference, will be the focus, whether directly or not, of a large part of the presentations and posters. With ITER now 58 percent of the way to First Plasma, a new era in fusion energy research has opened. It is against this background that, in Mahatma Gandhi's Ahmedabad-Gandhinagar, scientists and engineers from 40 countries will present and discuss the key physics and technology issues of fusion research ... for the benefit of all mankind. Throughout his long career Jean Jacquinot, the former director of JET and of French magnetic fusion research, has attended many conferences. But there is one he will always remember—the third Conference on Plasma Physics and Controlled Nuclear Fusion Research held fifty years ago in Novosibirsk. Fusion was a young science then and fusion devices, whether "mirror machines," "zeta pinch," "levitrons," or "superstators," were rather primitive and their results almost always disappointing. In Novosibirsk, Lev Artsimovitch, the head of Russian fusion research, announced that in their T-3 and TM-3 machines, plasma temperatures of 10 million degrees and energy confinement time in excess of 20 milliseconds had been measured—a full order of magnitude above the best results anyone had obtained so far. "It was hard to believe, it was like being struck by lightning," remembers Jacquinot. "I recollect overhearing a conversation between Artsimovitch and Gotlieb, his Princeton counterpart. Gotlieb, like everyone, was convinced that it couldn't be true—that the Russians had been tricked by something, most probably runaway electrons." They hadn't. Their "toroidal chamber with magnetic coils," or "tokamak," had demonstrated exceptional efficiency. When the results were confirmed by an independent team from the UK, the fusion world converted to the new device's architecture. Over the following fifty years and up to this day tokamaks have been true to their promise and ruled supreme on the fusion world.